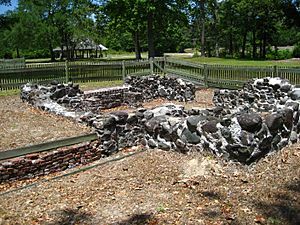 Brunswick Town is a colonial ghost town located beside the Cape Fear River in Smithville Township, Brunswick County, North Carolina, United States. It was the first settlement in the Cape Fear region, a major North Carolina port in the 18th century, and home to three colonial governors. Brunswick Town lasted 50 years (1726–76) until it was razed by the British Army during the American Revolutionary War and never rebuilt. Parts of the abandoned town were covered by earthworks during the American Civil War, and Brunswick Town became an excavation site for Cape Fear history during the 20th century. The Brunswick Town Historic District contains the ruins of 18th-century commercial and residential colonial homes, the St. Philip's Church Ruins, Fort Anderson, and Russellborough, the former governor's mansion. The town's historic district and St. Philip's Church are listed on the National Register of Historic Places. Brunswick Town is also one of the settings in which the Sleepy Hollow television series has been filmed. The area surrounding Brunswick Town was originally inhabited by the Tuscarora Native Americans. After these natives were defeated in the Tuscarora War (1711–15), English colonists began to move into the Cape Fear region. Brunswick Town was founded in July 1726 by Maurice Moore with the help of his brother Roger, owner of the nearby Orton Plantation. The two men were sons of South Carolina colonial governor James Moore and grandsons of Irish nobleman Rory Moore. Maurice, a future colonial governor and father of Supreme Court Associate Justice Alfred Moore, named the town after Brunswick-Lüneburg, the German territory ruled by Great Britain's reigning King George I. During the next few months, Brunswick Town grew rapidly and became a busy port for exporting forest products used for the Royal Navy and merchant ships, tar, pitch, and turpentine. When the village of Newton, now known as Wilmington, was founded in 1733, the two towns jointly formed the Port of Brunswick. During the 1730s, Brunswick Town became the political center of the Cape Fear region and seat of New Hanover County. In March 1731, George Burrington – the first royal governor of North Carolina – moved to Brunswick, and the town became the official port of entry for the Cape Fear River. The town was the (third) capital city of the Province of North Carolina, from 1743 to 1770. Over the next few decades the Port of Brunswick became the busiest port district in North Carolina, and shipped goods to Europe and the British West Indies. The growing city of Wilmington began to overtake Brunswick in terms of commerce, and eventually accounted for 75% of the port's activities. In 1748, Brunswick Town was attacked by Spanish privateers and held for three days until Colonel William Dry and Brunswick citizens drove them away. Royal governor Arthur Dobbs arrived in Brunswick in 1754 and moved into what became the governor's mansion, now called Russellborough. Dobbs' presence, along with the construction of a royal chapel, St. Philip's Church, kept the town alive while nearby Wilmington continued to grow economically and politically. After Dobbs' death in 1765, William Tryon was appointed governor of Province of North Carolina and continued using Russellborough as the governor's official residence. In 1765, the citizens of Brunswick surrounded the governor's home in protest to the Stamp Act of 1765 and placed Tryon under house arrest. The protest - one of the first incidents of armed colonial resistance to British rule - was the result of Maurice Moore's pamphlet The Justice and Policy of Taxing the American Colonies, a criticism of British taxation. The protest resulted in the end of stamp tax collection for the Cape Fear region. With the combination of Wilmington's continued growth and Tryon moving to his new residence, Tryon Palace in New Bern, Brunswick Town continued to decline. By 1775, the few families that still lived in Brunswick Town fled due to fears of a British attack during the American Revolutionary War. In the spring of 1776, British soldiers from the Royal Navy ship Cruizer attacked Brunswick Town. The soldiers, led by Captain Collet, burned most of the town's structures including Russellborough and St. Philip's Church. After the war, two or three families returned to Brunswick, but by 1830 the town site was completely abandoned and sold to Frederick Jones Hill, owner of Orton Plantation, for $4.25. In March 1862, Confederate States Army engineers began to survey the remains of Brunswick Town. The Confederates built earthworks and trenches in the town site, covering the remains of several burnt structures except for St. Philip's Church. The fort was constructed to protect the city of Wilmington 18 miles (29 km) upstream, a vital port during the Civil War. The bastion was named Fort St. Philip, but renamed Fort Anderson in July 1863. During the attack on Fort Anderson in February 1865, cannonballs shot from Union ships in the Cape Fear River hit the walls of St. Philip's Church and are still evident today. When the Confederate forces were defeated, Union soldiers desecrated several graves at St. Philip's Church and removed the building's cornerstone. Confederate bodies were placed inside the church. In 1899, the newly-formed Cape Fear Chapter of the North Carolina Society of The Colonial Dames of America visited the Brunswick Town to pay homage to Revolutionary War casualties. In 1902, the chapter erected a marble plaque inside the roofless ruins of St. Philip's to commemorate Brunswick Town co-founder Maurice Moore. Archaeologist Stanley South began extensive excavations at Brunswick Town in 1958, and items such as bullets, buttons, and a cannonball were retrieved inside the St. Philip's Church ruins. 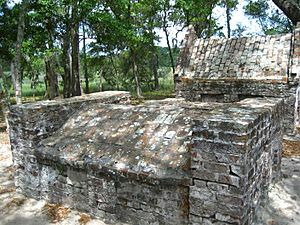 The remains of Brunswick Town are now a state historic site. Visitors may tour the town's remains and the earthworks of Fort Anderson. Brunswick Town, North Carolina Facts for Kids. Kiddle Encyclopedia.